What's New Archive - Apollo T-Shirts Are In! Apollo T-Shirts arrived just in time for Memorial Day Weekend / Oberlin College Commencement. 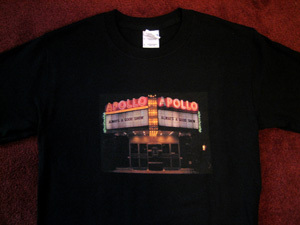 These black shirts show the local landmark lit up at night and proudly saying on the historic marquee that there is "Always a Good Show" at the Apollo. Shirts are available in many sizes and are available online and in the Museum Store of the Oberlin Heritage Center at 73 1/2 South Professor Street (south of the Conservatory construction zone).